LUNCH: Feel free to bring your lunch with you, or you can purchase one from the recently updated Vet School Cafe. An electronic copy of the lecture notes will be made available a few days before the course. In order to read the notes, you will need Adobe® Reader®. Download a free copy here. Attendees who register at least one day prior to each forum and provide an e-mail address will have a parking pass issued to them via e-mail which will permit parking in the CVM Deck. If you do not receive the parking pass via e-mail, allow yourself time to pick one up from the reception desk in the front lobby. You may continue to park without a permit in the Fairgrounds parking lot at the corner of Blue Ridge and Trinity, or at Carter-Finley Stadium. There is a bus that runs from Carter-Finley to the CVM every 15 minutes. 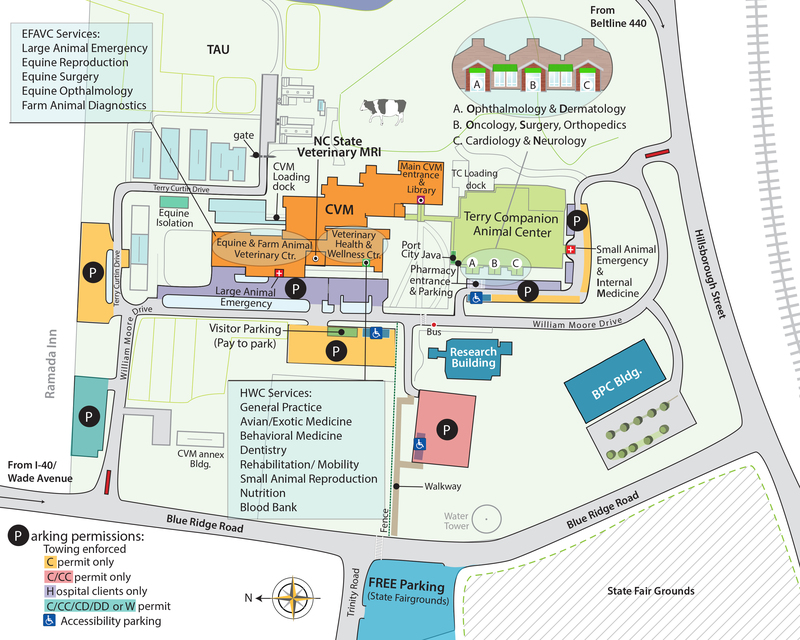 The CVM parking deck requires a permit. Also, cars parked in the hospital client lots will be ticketed. Directions and a map can be found below.